If you sell something online or if you run a business with an online presence—even if you’re just having a good time growing your personal brand—you’ll have the honor and the privilege of chatting directly with customers. 24 hours a day. 7 days a week. This always-on mentality is an amazing privilege, and at the same time it can provide some challenges for small businesses. How can you best respond when conversations are happening constantly? And what if they’re not all positive? 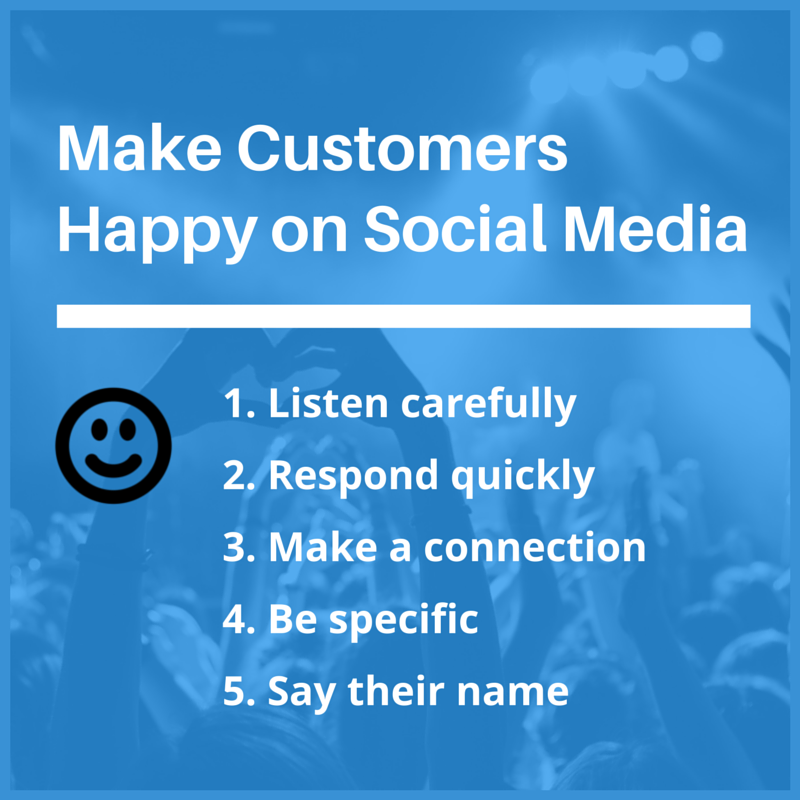 How do you manage to make customers happy on social media? I discovered a few tips that might help out here, some strategies and insights that are backed by a fair bit of research. There’s an art to making customers happy on social media, and the good news: There’s also a recipe. These are the five parts I’ve encountered in my research on customer happiness. It’s interesting to note also that the order here is somewhat important: Listen before you respond, for instance. Among the 10 Buffer values, seldom is there crossover between the specific phrasing of a value and the naming of a social media marketing strategy. We’re grateful for the overlap with listening. Social listening is the process of finding the meaningful conversations and insights from all your mentions on social media. In particular, these elements from our Buffer value seem to really resonate when it comes to successful social listening. 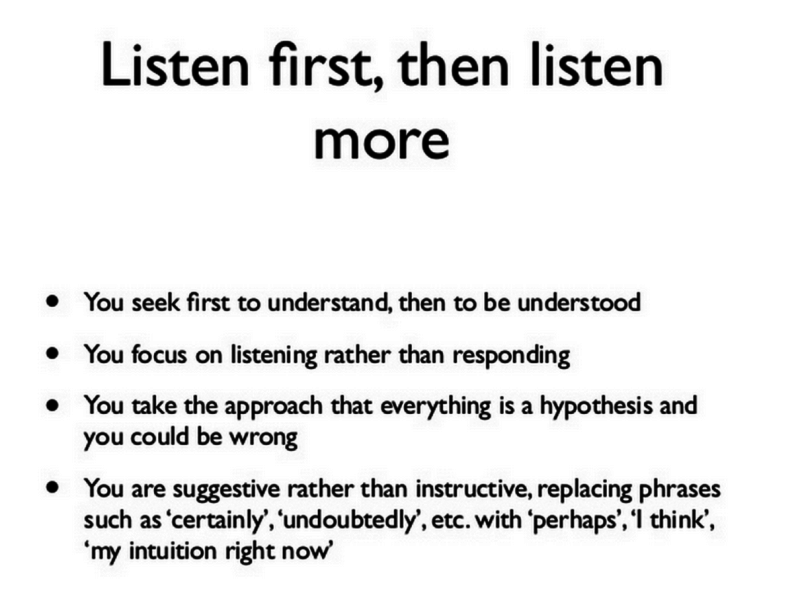 I really love the way that Lolly Daskall outlines the importance of listening as it relates to business and leadership. I think her description rings true for social media as well. We listen to stay informed. We listen to gain information. We listen to acquire knowledge. We listen to obtain wisdom. In terms of finding the conversations, there was some really neat research done by Mention, who analyzed over one billion brand mentions tracked through their tool. They found that 92 percent of people talking to brands have fewer than 500 followers. So you should listen for more than just big influencers. They also saw that 30 percent of tweets containing company names don’t use the company’s twitter handle. So you should listen for multiple keywords and variations beyond just your username. There are a number of useful tools you can put together into a social listening dashboard. 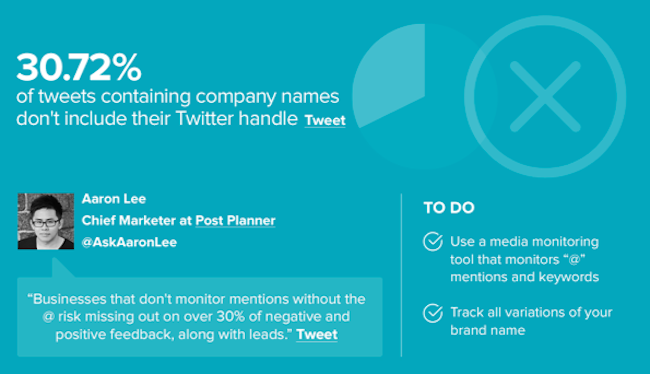 Mention is one of our favorites, as it’s able to track just about any variation of you or your brand name, as well as keywords, phrases, and hashtags. One cool tip is to sync up Mention with to build a listening dashboard, alongside your RSS consumption. Additionally, you can dive quite deep into Twitter using Twitter’s built-inAdvanced Search. You can drill down into specific accounts or hashtags or keywords, including going way back into the archives if needed. When conversations happen about your brand on social media, you have the chance to get involved and make a positive impression on those talking about you. If you miss those opportunities, you miss the chance to make an impression. You miss the chance to provide answers or solutions or to steer the conversation in a meaningful direction. And to go a step further, people might not think you listen or care. Brands that never respond not only fail to make a positive impression, they can sometimes make a poor one with their silence. Twitter is perhaps the most real-time of the major social networks, with the half-life ot tweets measured in minutes. Consumers expect this rapidity to extend to their conversations with you, too. Research by Lithium Technologies found that 53 percent of users who tweet at a brand expect a response within the hour. The percentage increases to 72 percent for those with a complaint. If you can pull of this quick feat (tips on this are below), you’ll go a long ways toward setting yourself apart. Few companies are able to answer so speedily. A study done by Simply Measured found that nearly all brands—99% of them—are on Twitter and 30% have a dedicated customer service handle. 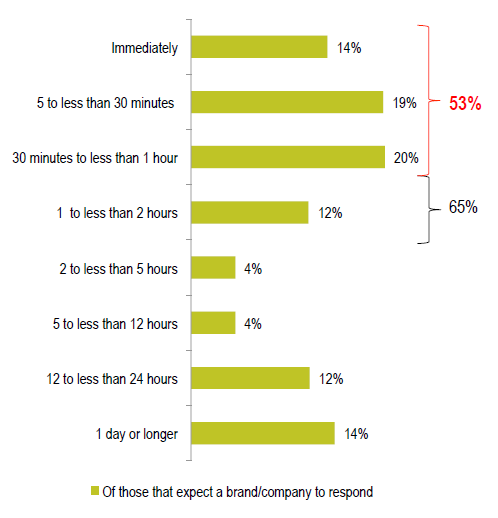 Still, the average response time was 5.1 hours with only 1 out of 10 companies answering within an hour. Monitoring and listening with the tools mentioned above will be a great start for replying fast. Additionally, tools like Must Be Present can help you track your response time on Twitter, or you can invest in software like Spark Central to stay on top of your customer support tweets. If you’ve got a big team of support heroes, then a third-party tool like Spark Central is a great route to go. If it’s just you, then you might look into the notification settings for your social network. For instance, with Twitter, you can sign up for Twitter email alerts and customize them so that you only receive the messages that you’d like—for instance, @-replies or new follows. Mark Granovetter in the American Journal of Sociology presented his social network theory that visualizes people as nodes. Those who are connected through a relationship are a single link away, while distant relationships are only a few links away. Granovetter’s theory came out in 1973, well before the advent of social media (or the modern Internet, even), yet it still applies directly to the power of networking on Twitter, Facebook, and the rest. As a follow-up to Granovetter’s theory, a trio of UK researchers observed that most people are no more than six links away from any other person. Put another way, word of a poor Twitter experience can spread far and fast. Jeremy Waite found that a tweet can spread from one person to 2.7 million within four generations—which is great for the amazing content you produce and share, and good to keep in mind for the conversations you have as well. From a high level view, this strategy comes down to your perspective with social media. It’s an honor and a privilege for someone to reach out to you on social media, amid the millions of other profiles and accounts to connect with. When someone chooses to chat with you, be grateful, and respond. Yes, they reply to everyone! In the book Traction, Gabriel Weinberg and Justin Mares talk about 19 traction channels to help gain more customers. One of these channels is unconventional PR, which includes customer service. You can be so great at customer service that it becomes free, unconventional PR for your brand! Consider: The average top brands worldwide tweet at least 12 times a day, and54 percent of these brands are sending less than one @-reply per day. There’s a lot of room to improve (and stand out) amid those numbers. When possible, connect 24/7 with your audience. When not possible—and totally understandable if you’re a small business or a one-person team—communicate your availability. Zappos does the 24/7 thing in a cool way by having their Twitter support team say hello and good-bye as they change shifts. American Express gives us a good example of how to communicate when you turn off for the night. Another way to make a one-to-one connection or conversation is through Direct Message. Our co-founder Leo wrote a great article on Social Media Examiner aboutTwitter and customer service, and he laid out this quick 3-step guide for what to do when you’re communicating with your many people in your audience about a similar topic or bug. DMs are also a great alternative to the “please send an email to name@company.com” line. You make a connection with your customer without sending them elsewhere to talk to you and dragging out the process unnecessarily. Not only do you risk alienating your community by not responding, you can also create harmful reactions to your brand. A research study in the Academy of Management found that companies who accepted responsibility for a problem saw favorable responses. Those who were slow in responding to complaints did not. It’s all a quite intuitive conclusion, though interesting to see backed by research in addition to intuition. This strategy is one borrowed from email marketing, where specificity—often seen in the form of segmentation and personalization—is a key driver of higher open rates and clickthrough rates. A study by Jupiter Research found that relevant emails drove 18 times more revenue than general, broadcast emails. Shane Snow and Jon YouShaei tested specificity in a series of cold emails, changing things like the subject line and the thank you message to see what worked best. Of the cold emails, sent in impersonal batches, only 1.7% of people replies, 12 out of 700. Following the study, Shane cold emailed a single contact with a highly personalized email. He got a reply. Replying with specificity to your customers is a wonderfully smart and simple habit to get into. All it takes is a bit of notice. 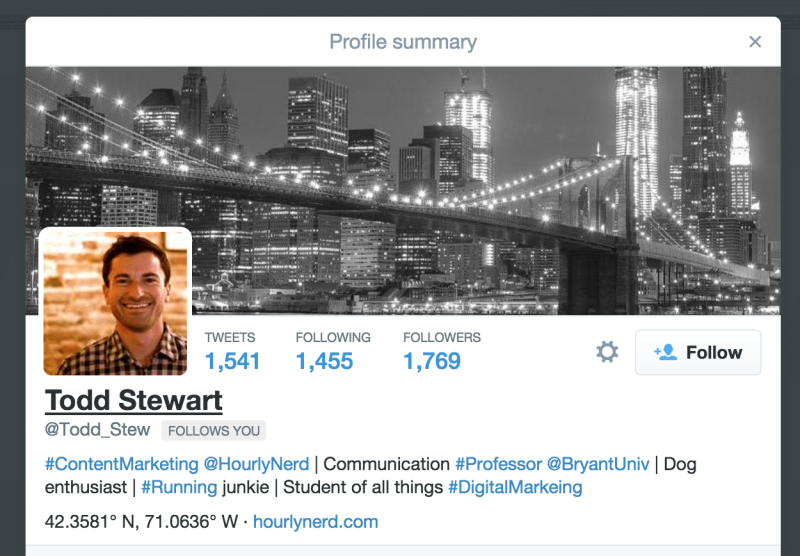 When someone mentions you on Twitter, you can click on their username to see a popover with their bio and information. From the above bio of Todd’s, I can tell with just a bit of Google searching and Twitter clicking that he’s based in Boston, he does content for a consulting company, he teaches at Bryant University (“Go Bulldogs!”), and he loves running and dogs. There aren’t too many downsides to an impersonal Twitter response. A response, any response, is better than none. Personalization is what can help take your conversations from everyday to extraordinary. If you aim to delight your customers at every turn, then personalization in your social media replies is a great route to consider. A Ball State study found that addressing customers by their real name is considered a best practice of brands on social media. And certainly, the psychology backs it up. “You” or your name is considered to be one of the five most persuasive words in the English language. Some of the biggest brands in the world rely on this personal touch with their interaction. In the book High-Tech, High-Touch Customer Service, Micah Solomon shares an acronym used by Apple to help inform its customer conversations. In most cases, the customer’s first name will be easy enough to find on their profile. 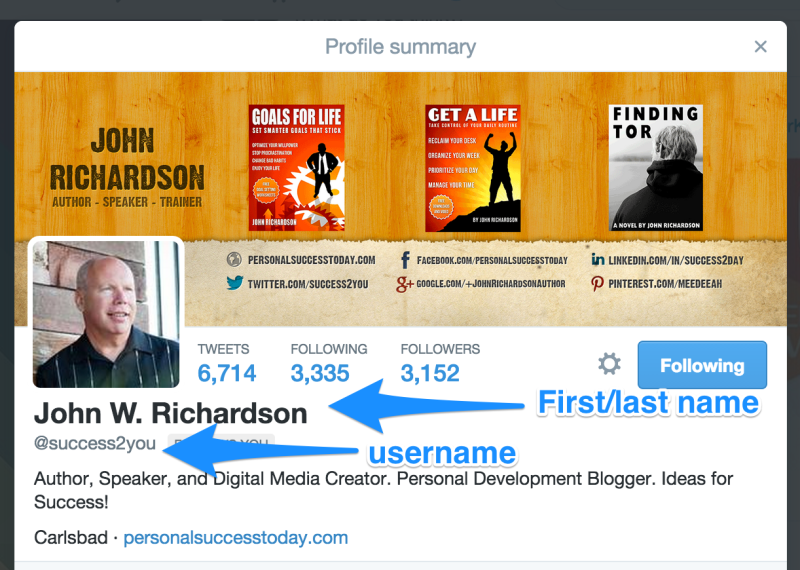 Twitter bios, for instance, allow for a username (the @-handle the person chooses) and for a first and last name. Take a quick peek at the name before replying, and you can easily add it in to your tweet or comment. Like personalized messages, adding someone’s name is neither a deal-maker nor a deal-breaker. It’s just another nice touch. And all these nice touches could very well add up to something quite meaningful over time. What strategies have you found most helpful in replying to people on social media? I’d love to learn any of your tips on the subject. Feel free to leave any thoughts at all here in the comments!